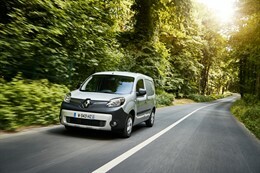 The Renault Kangoo ZE light commercial vehicle gains 50% range improvement and simplified charging in latest generation. In January 2017, the Renault Pro+ division presented the new Kangoo ZE, an electric van that incorporates a wealth of innovations designed to better meet customer requirements and environmental targets. Now, the Kangoo ZE’s driving range marks an increase of over 50 percent, which means it can cover even more ground than its predecessor, reaching 270km over an NEDC (New European Driving Cycle) test, equivalent to 200km real use in the summer summer months compared to 170km previously. A new battery mated to a new motor and the incorporation of a heat pump combine to produce the best driving range in the electric LCV (light commercial vehicle) market. The Kangoo ZE is even faster and easier to charge. A new, twice-as-powerful charger enables the vehicle’s battery to be fully charged in as little as six hours (easily possible overnight), whilst a one-hour lunch break allows enough time to add a 35-kilometre top-up, helping users to make optimum use of their working day. New connected services, ZE Trip and ZE Pass, simplify the charging process at public charging stations across Europe, which in turn eases day-to-day life for LCV users. The Kangoo ZE has topped the European small electric van market for the past six years, achieving sales in excess of 25,000 units since its launch in October 2011. The latest version of the Kangoo ZE is built in France and will be available in Europe from mid-2017. “Renault Pro+ tops the market when it comes to electric LCV sales in Europe, with a 29.5 percent market share as of the end of May 2017. Our brand consistently strives to meet and exceed the expectations of its business customers. With the Kangoo ZE, Renault Pro+ has shifted the goalposts in terms of driving range in this fast-growing sector (up 16 percent at the end of May 2017), while continuing to provide additional bespoke services and products,” said Ashwani Gupta – SVP, Global Head of Renault-Nissan Light Commercial Vehicles Business Unit. “In terms of all-electric mobility, Renault is continually improving and refining its electric vehicles to extend operating range and make charging as simple as possible for its customers. The technological innovations built into the Kangoo ZE – a new high energy density battery mated to a new motor, plus a heat pump and a new charger that is twice as powerful as before – have resulted in a driving range gain of more than 50 percent, along with a faster, simpler charging process,” Gilles Normand – SVP, Global Head of Electric Vehicle Business Unit.